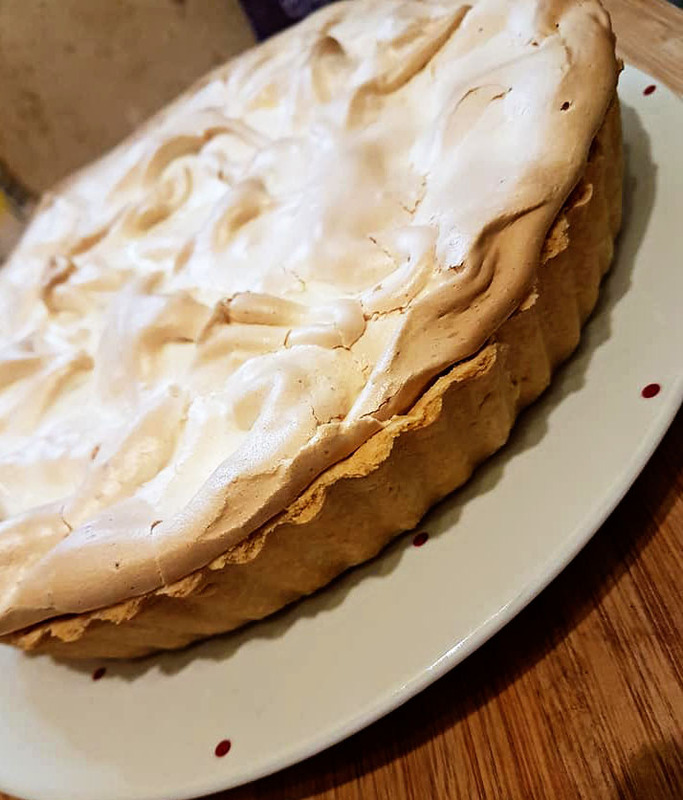 One of my favourite deserts, and I managed to change up the recipe so that it was sugar free, and although the meringue isn't as 'sugary' as it would normally be, it is still delicious and light. To make the pie crust, add all ingredients into a food processor and blend until it looks like breadcrumbs. Slowly add water until it forms a dough. Roll the dough out and press into a 6 inch loose based flan tin. Prick the base with a fork, and line with foil and baking beans. Bake for 15 mins, then remove the beans and cook for 10 mins more until browned. Leave to cool whilst making the filling. Stir together the cornflour, water and lemon juice in a saucepan. Heat to boiling stirring constantly until thickened. Remove from the heat and leave to cool slightly. Whisk the eggs and egg whites together with lemon zest and granulated sweetener in a bowl. Add a third of the hot filling into the egg mixture and stir to combine. Pour the egg mixture into the hot filling and return to the heat for another minute, stirring constantly. Remove from the heat and stir in the margarine and food colouring (if using). Stir to blend. Pour the filling into the cooled pie crust and allow to cool whilst making the meringue. Stir the cornflour and water together in a bowl and heat in a saucepan until thickened. Leave to cool. Beat the egg whites until foamy, then add the granulated sweetener whilst beating until it forms stiff peaks. Add the cornflour mixture a little at a time, stirring after each addition. Add the vanilla extract and stir well. 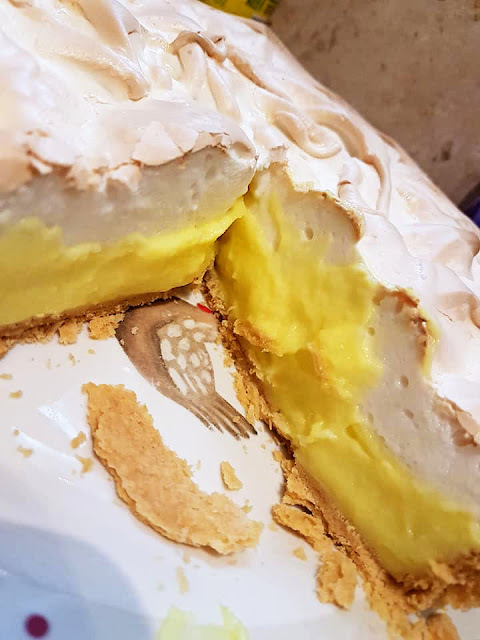 Spread the meringue over the cooled base ensuring it touches the crust all the way around. Bake in the oven for around 10 minutes until it is lightly browned. Allow to cool before serving as this will allow the filling to set, making it easier to cut. 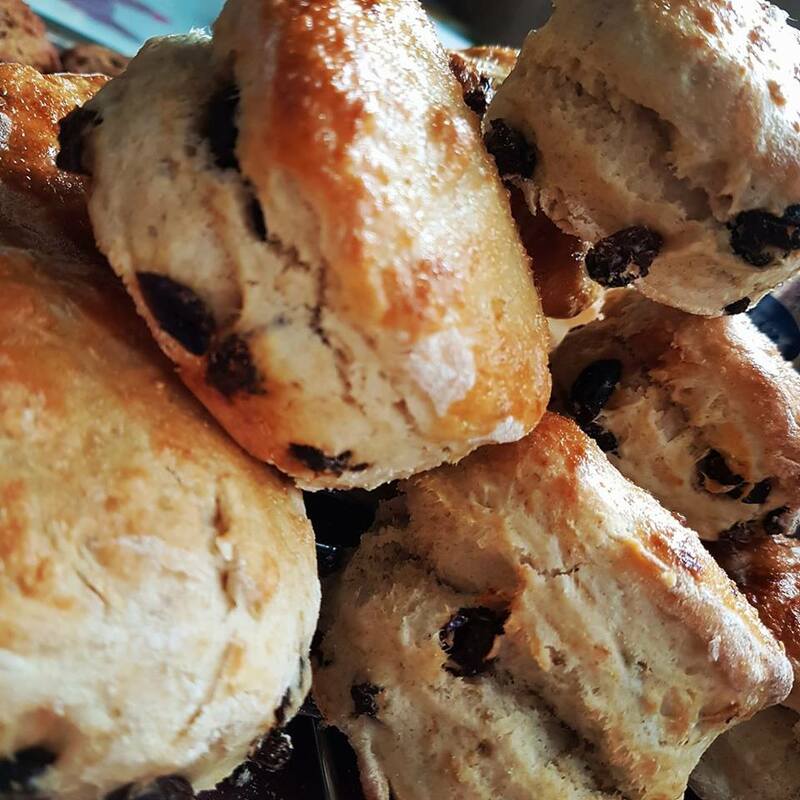 So sorry for the delay in writing up the recipe for the Sugar Free Scones. I know I promised you the write up for it a few days ago, but things got a bit busy again, and it completely slipped my mind! Anyway... here they are - and I can honestly say they were really tasty... look at the bottom for the recipe. If you try them, can you leave me a comment to let me know what you think? Thanks muchly! Pour the crumbs into a mixing bowl and add in the raisins. Stir to combine evenly. Add the milk to the dry ingredients and stir with a knife until it forms a rough dough. Tip out onto your work surface and knead lightly to bring together. Roll out to around 3cm together. Dip your scone cutter into some flour, then cut out your scones. Bring the mixture back together and knead slightly, re-roll and cut out as before. The mix should make around 12 scones. Place the scones onto a baking tray lined with baking paper. Brush the tops with beaten egg and bake for around 10 minutes, or until risen and golden. 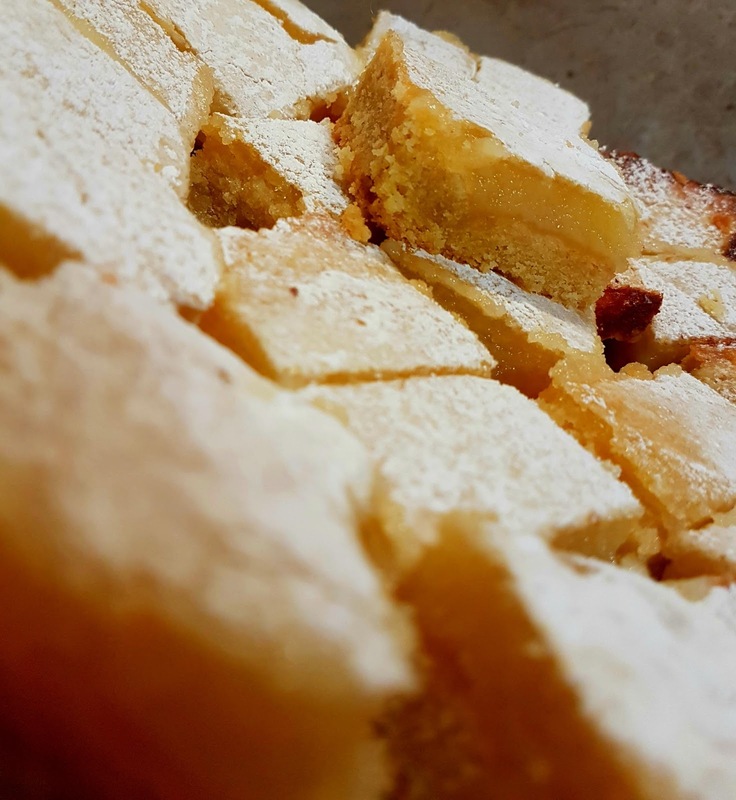 As promised, here is the recipe for the Lemon Bars that I shared on Facebook the other day. It is a really easy peasy recipe, and I have to admit that these little beauties didn't last long. Be warned, they are very MORE-ISH!!! Just scroll down after the picture for the recipe. And don't forget to leave me a comment if you make them to let me know what you think. For the crust, blend the butter, flour and sugar - I did mine in the food processor, but by hand in a medium bowl will work too. Press the mixture into the bottom of a 10 inch square cake tin which has been lined with foil. Bake in the oven for around 20 minutes until firm and golden. For the filling, whisk the sugar, flour, eggs and lemon juice. Pour over the baked crust. Allow the bars to cool in the tin, then chill in the fridge for around 2 hours until set. Dust over the top of the lemon bars with icing sugar. Cut into squares and serve. I really need to get blogging again as it's something that I really miss. Somewhere to write down what's happening, things I'm doing and the pet life in the household... lol. At the minute, he's been part of the family for a couple of weeks and has settled in really well. The photo doesn't do him justice really as he has some beautiful grey and black mottling and some bright orangey-red spots. He is such a cheeky thing though... spoilt as he won't eat his staple food, but likes his treats. He is also a bit stroppy. 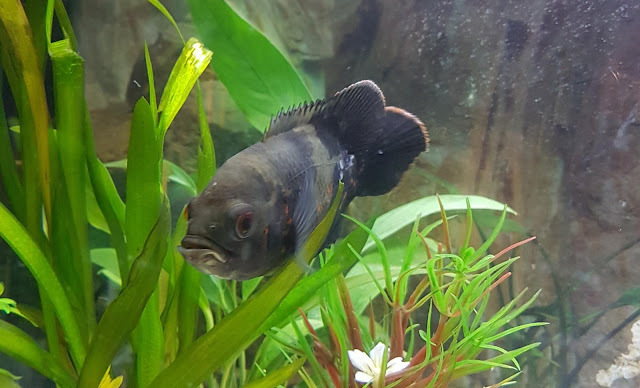 He loves nothing more than throwing his plants around the tank and doing a bit of redecorating. This is the reason why his name has changed... he's been Percy (the original name). He's also Sergeant Oddball.... Stroppy Sydney.... but generally just 'Gorgeous'. He has quite a cute character about him... and I can't wait for him to grow up a little to see that character come out more. I've had a break.... again. April... seriously... is that the last time that I blogged?? Well, I would like to say that I've missed it, but I haven't really had chance to! There's been so many things going on for me that I just haven't had the time. I've been caring for two little additions to our home - a couple of little leopard tortoises. I've also been doing a course at college, which has now come to an end until September. I've been working, and I've been out in the garden growing flowers and weeds. So.... normal service will resume properly now, and I will be posting a few cards and things I've been making over the last few months. I hope you've had a little patience with me, and glad you're still here!!! I am so glad that you enjoyed the shows on Hochanda yesterday - it's always a pleasure to work with the lovely folks down there. And it's also a joy knowing that you love the selections that are bought to you by ourselves and JoyCrafts. The stamps from the shows today were no exception, so I thought I would share a little card or two with some of the products from the show. The first card I want to share with you is this little frame that was die cut from red and white cardstock. It's quite a simple card to build up. Basic matting and layering onto the card base which was a 7 inch x 7 inch card, coming down in quarter inch sections. 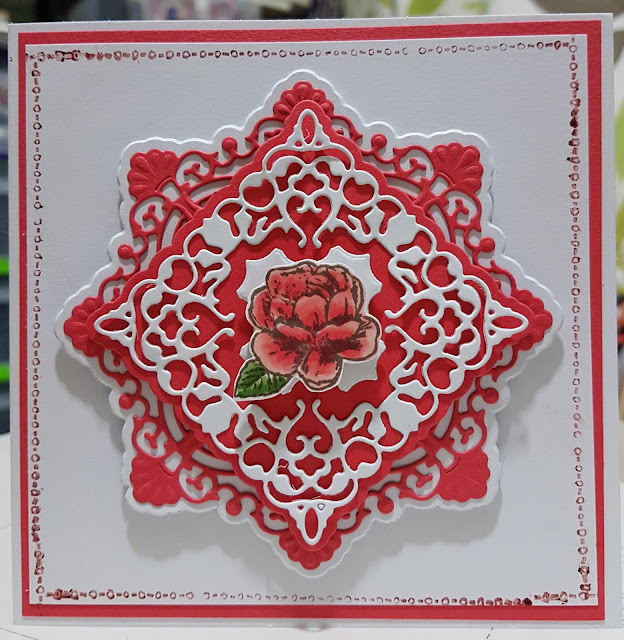 The first layer was cut from white - this was the outside edge of the die, followed by a layer of red which had the inside detail for the diecut. 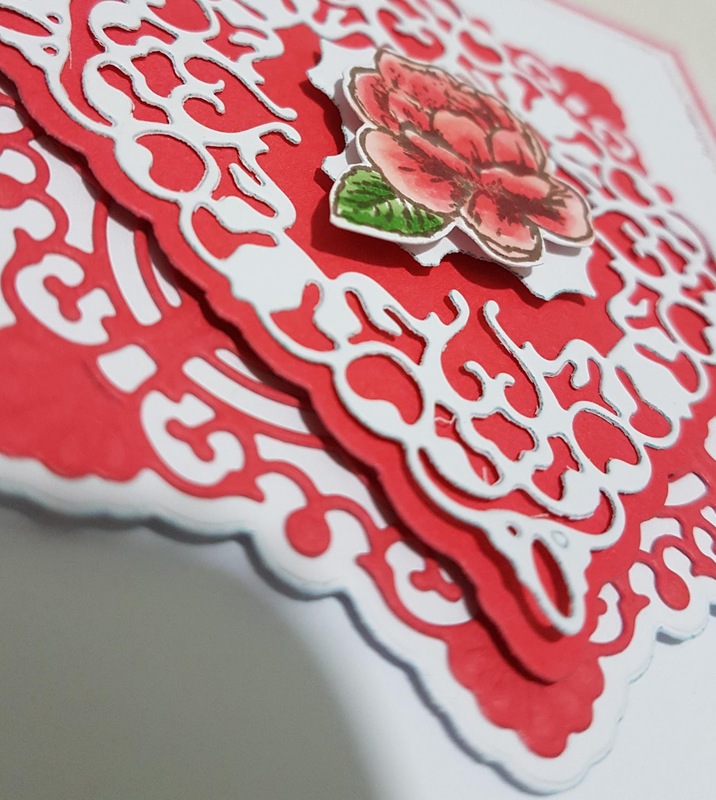 The very centre die cut was a square from the Card Model we had on the show - these are the ones that make the three dimensional cards, and this section is the lacy middle. It fits, as you can see, perfectly into the middle of the other die. I finished it off with a little rose stamp image that was coloured with copic markers. The little card below was an A5 card, and it is one of my favourite ones from the shows. You know sometimes when you have an idea in your head for what you want to achieve with a card? Well, this wasn't it when I started.....!!! I didn't really know what I wanted it to finish like, I was just playing along with the various dies I had out in front of me, and came up with this as a layout, so just stuck it all together and it seemed to work. The centre is the circle die we had on the show, and I laced around the centre with a piece of 1/4" satin ribbon. The white middle is the layer that comes with this die set, and you can see you can use it for a layer, or indeed for an aperture if you wish. 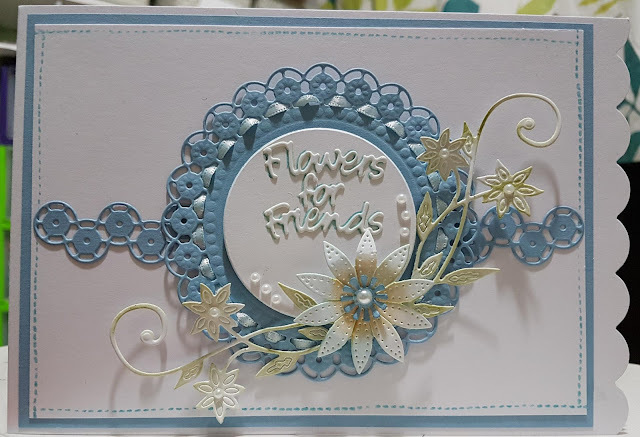 The flowers were from the little sets we had - the embroidery dies - but I just loved the detail that was in there so left them plain, and used a little bit of distress ink to add some colour to those and the swirly bits. The outside stitchy edge was another popular set of stamps. These were borders and there were OODLES of them on one sheet....! I will try to bring you a little bit more inspiration tomorrow... I hope you can join me. So... what's happened this last few weeks.. well, to start with it's been Easter, so spent a little time doing not alot combined with some bits for work on and off... I made some wreaths and treats that I will share on another post, had a bit of time with family, went away... had a poorly wooflet that needed a couple of ops, but is now all sorted and running fit as a fiddle. And finally I'm back here... to share these. The stamps and dies are part of a bundle that I have bought to Hochanda as part of the Joycrafts shows today, and I think they work together absolutely perfectly. They are so sweet. 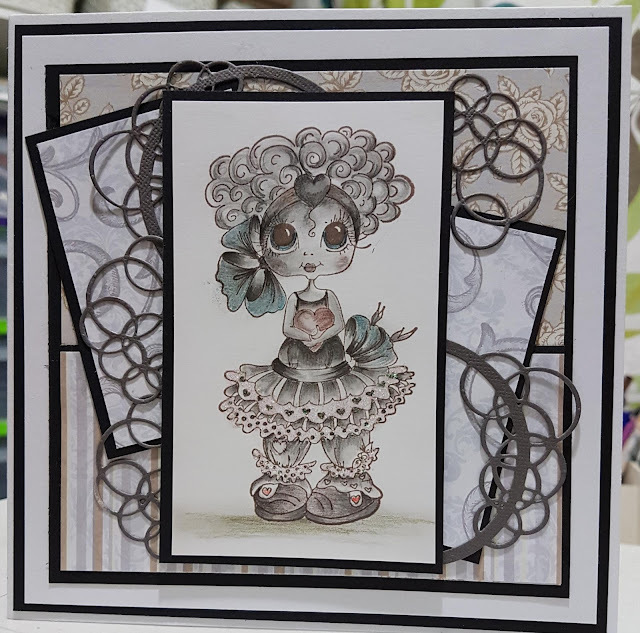 The images are by Sherri Baldy, one of my favourite stamp designers I must say, and if you look through my blog, I'm sure you will come by a few of the things I have made with her stamps in the past. She is a lovely lady too - such a sweetheart. Anyway... back to the subject in hand... and as you can see, we had a choice of two stamps available today. The one above I think is my favourite as it has woolly hair that is just adorable. I used the no lines colouring technique, by stamping with a Desert Sand Momento ink and colouring in with copic markers. I still love to spend the time adding freckles to the cheeks with gel pens, so this just finishes it off nicely. The card below is a larger card, 8x8" and has Graphic 45 papers that I found, and decided to use for the background. The colours were really nice and bright - just perfect for a summery card. Well, I say summer in the broadest sense of the word as we had snow yesterday!!!! 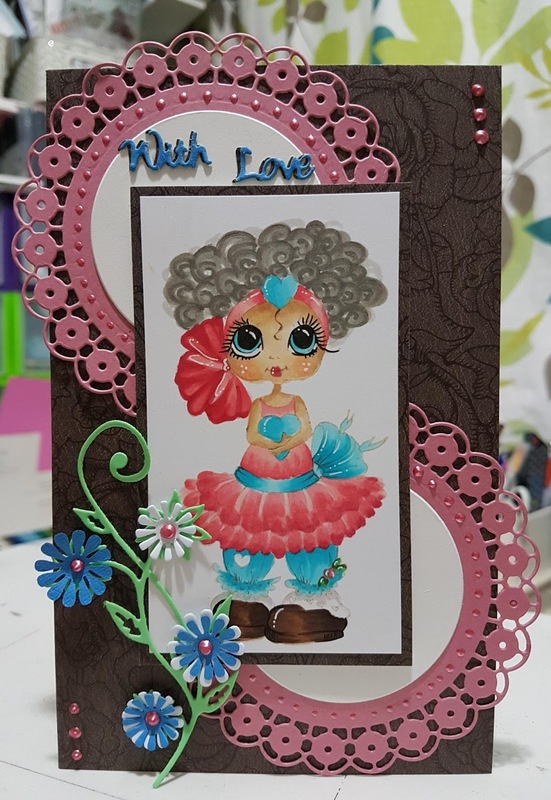 On this card, I used the other lovely Sherri image, and stamped it and coloured with copics again. I chose to use one of the corners from the show to create the rectangular frame that goes around the outside edge of the image. Just by placing them together and overlapping you will be able to cover a larger area with a more squarer format. We did the circular die in this too - and it had some beautiful daisy type flowers in it.. just nip off to Hochanda to check out the shows - they were on today at 7am, 1pm and 3pm. Something a little bit different on this one for you... a pencil toned image. Stamped in Tuxedo black and shaded with HB and 6B pencils. I also added a little bit of sepia coloured pencil too for a dash of tone to the image. 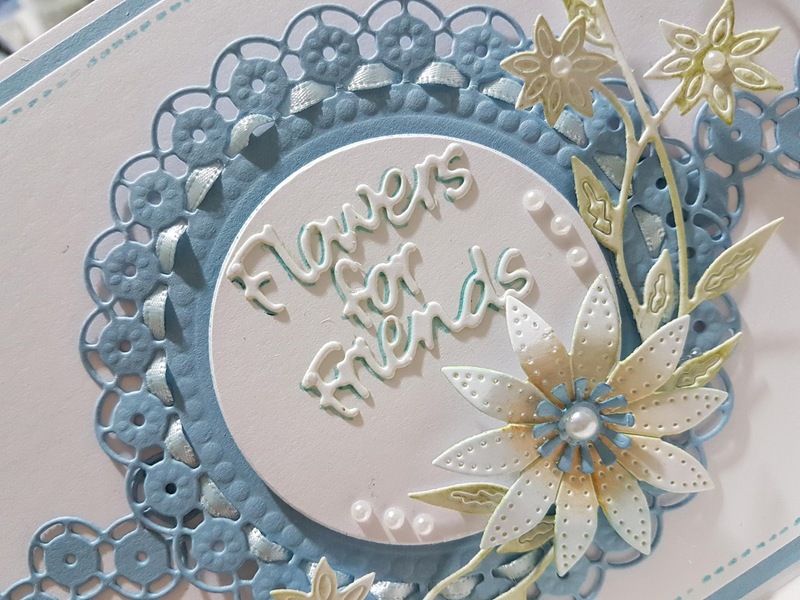 The dies around the image - the bubbles - are coming up at 3pm - and make a lovely background to your designs if you aren't really into flowers and flourishes. Well... that's it for today, but I hope that you can check back to see my other posts... I have them lined up and ready, they just need to have the PUBLISH button pressed.. Welcome to my blog! I hope you find a few things on here that inspire you... there are lots of things to look at - stamping, decoupage, die cutting, crafting and tutorials.... and most importantly - general chatter about most things I get around to doing... I hope you can join me on my Creative journey.